Sometimes getting behind on reviews can have its benefits. For example, I’ve gotten to think about this novel for longer after finishing it than I expected. When about halfway through Chris Evans’ Of Bone and Thunder I was still finding it hard to get into, appreciate, or particularly enjoy. Upon finishing it I had a hard time figuring out what of substance I could even say about it. Upon reflection I realized that my failure to be drawn into the novel stemmed largely from it just not being what I thought it would be, of being the novel I probably unreasonably wanted it to be. Perhaps you’ve read a book with the same mindset and results? Once accepting the novel for what it actually intends to be I find a deeper appreciation for it, and Evans’ “daring” to try something a little different. Though I’ve grown to appreciate several aspects of the novel, some problems still remain in my mind. Unreasonable reader expectations began with the novel’s marketing description as “Apocalypse Now meets Lord of the Rings”. I’m always wary of such comparisons to authors or works, so this wasn’t a strong expectation for me at least. But it may be for other readers. Of Bone and Thunder is a fantasy novel with allegorical themes recalling the Vietnam War. So those titles only serve as overused proxies for highly recognized associations with ‘Vietnam’ and ‘Fantasy’. Evans’ novel has little to nothing in common with the plots or styles of Coppola’s film (or Conrad’s Heart of Darkness) or Tolkien’s trilogy. Of Bone and Thunder keeps sharp focus on a handful of characters who are soldiers waging war in the land of Luitox for a distant kingdom (The Kingdom). Their enigmatic enemy are the Slyts, a reclusive jungle-inhabiting people skilled at guerilla-style tactics. Beyond the conventional warfare of the common soldiers, the conflict hinges on the power of – and intelligence gathered by thaums (as in thaumaturge) on each side. Balancing their handicap of unfamiliar territory and foe, the Kingdom also has the advantage of flight, in the form of lethal, but volatile, dragons. One thing Evans does very effectively is include a cast of characters who span the class spectrum of the Kingdom’s military: thaum, commander, dragon-tender, common soldier, covert op, etc. For most of the novel these characters are largely skewed to the male gender – as it would be if it were actually the Vietnam War, but gradually some female characters enter the novel, and thankfully in ways that don’t just involve romantic interest for the men – though that over-worn path is still traveled. With a focus on individuals of the Kingdom, the novel captures a sense of their psychology and trauma, fighting what seems an almost pointless campaign against an enemy barely known for a distant ruling class that is barely familiar itself. These parallels to Vietnam are blatant, and rather familiar. And here is where I really wanted Of Bone and Thunder to be something else. Glimpses of the Slyts kept making me want to see and know more about them – their reality and point of view on this war – and see less of the American proxies of the Kingdom. At first it seemed unclear if the Slyts really existed as the propaganda and rumors of the Kingdom said, or if they were even remotely threatening. Written truly different from the recognizably human members of the Kingdom, the Slyt society seemed less a direct version of the Vietnamese and therefore has great potential for deeper, unique development in what is a fantasy novel. But a novel from the point of view of the Slyts are not what this is. 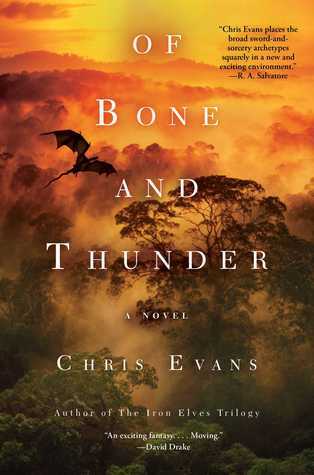 Ultimately how much a reader may enjoy Of Bone and Thunder may come down to whether it is read as a developed fantasy that recalls aspects of the Vietnam war, versus a novel of the Vietnam War where some elements are swapped out with some fantastic entity, like dragons. For me, some parts of the novel recalled the pulp style writing that science fiction magazines have consciously tried to avoid, like a scene from a Western where guns are simply replaced with lasers, cowboy is replaced with spaceman, etc. I finished Of Bone and Thunder somewhat perplexed over why it was ever written as a fantasy, and not just as a mainstream novel of the Vietnam War. I was left with the thought that perhaps it’s because the themes and elements of the war are already well-tread. The fantasy aspect and exploration of using dragons or mage-combat in warfare is the draw for this. As long as you enter into the novel with a better sense of what to expect in terms of the story’s focus and find that intriguing – or simply enjoy well-written dialogue and characters in a fantasy setting such as this – the novel is one to check out.